Root canal treatments are scary, but what happens when you’re finally done with the procedure? What can you expect right after the procedure, how should you deal with these contingencies and when do you know when you should head back to your dentist? Right after your root canal treatment, the first thing that you might notice is tenderness of your gums. This is a normal immediate complication of the procedure because of the dam that was put in place in order to isolate the tooth. In order to keep the dam in place, your dentist had to use a clamp which exerts pressure and could have bruised your gums. However, gum tenderness should go away in a day or two. If the pain persists after the second day, call in your dentist. While it’s not really the toothache which you were running away from in the first place which you felt, but you will definitely some tenderness radiating from the affected tooth. However, the pain should be controlled with the help of over-the-counter analgesic such as ibuprofen or acetaminophen. The most common reason for why patients who go through root canal procedures complain of dental tenderness is because of the normal inflammatory process that the patient basically undergoes. 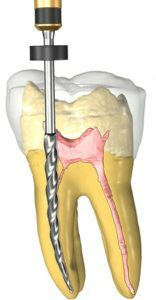 The drilling of the tooth is enough to send your body into a protective process of healing which actually leads to swelling of tissues and pain. However, it’s also possible that the reason for why your tooth feels uncomfortable is because there is an ongoing infection. It might be that your dentist was not able to clean the dental root as efficiently or that the access cavity was not sealed off completely allowing pathogens to penetrate into the tooth. If your dentist determines that this is the case of the pain, then expect to receive a prescription of antibiotics on top of your analgesic. Especially just days after the procedure, it’s always better if you favor the treated tooth in order for you to ward off any untoward incident. For instance, the dental filling material may not have hardened enough just days after after the procedure, more so if temporary filling was used in the case of treatments that require two trips to the dentist. To err on the side of caution, only use your tooth when your dentist has finished completely rebuilding it to prevent any chips or breaks that could irritate or contaminate the tooth.